At $2.92, the national gas price average has dropped four cents since the beginning of June. Today’s average is three cents less than a week ago, six cents more than a month ago and 58 cents more expensive than a year ago. South Carolina’s $2.58 average is the cheapest average in the country. It has gone down five cents since the start of June and four cents on the week. 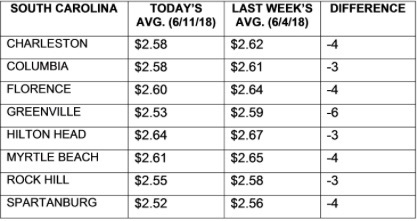 In North Carolina, the average ($2.74) has dropped four cents since the start of June. On the week, the state average has gone up one cent.